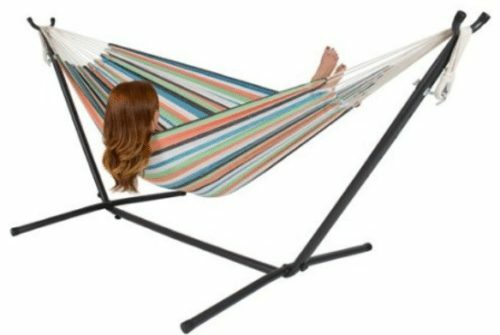 HAMMOCK CAN HOLD TWO PEOPLE IN, THE ROPE IS UPDATE VERSION, LENGTHEN TO 118 INCHES LONG, USE THE STRING AND HOOK TO HANG MORE STEADILY. Features an integrated drawstring stuff sack that doubles as a convenient storage bag for your gear, gadgets or other personal items. VERSATILE and COMPACT makes it ideal for hiking, camping, boating, traveling, back-yarding or beaches,can be use as beach Mat;Easy to setup, extremely compact and ultra lightweight , Easy to carry and pack with the small sack, Easy to be cleaned and dry quickly after being wet. 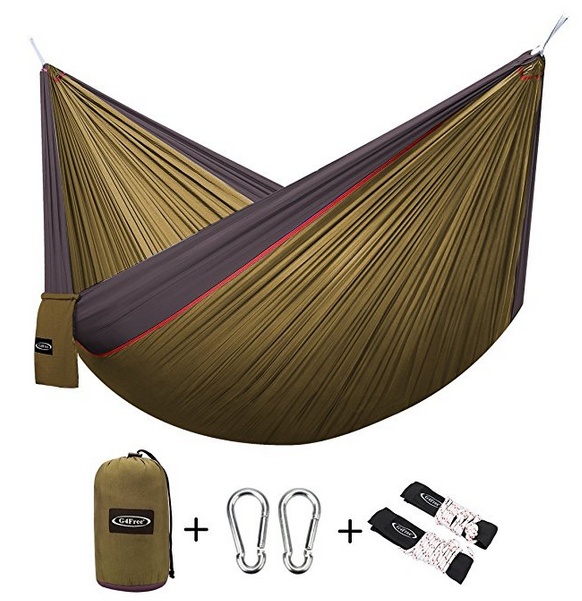 DURABLE and HIGH-STRENGTH, maximum capacity for up to 660 pounds, steel carabiners, super strong breathable and quick drying nylon fabric and is constructed using heavy duty triple interlocking stitching. TWO SOLID STEEL CARABINERS and two extra tough 9 ft 10 inch nautical grade hang ropes with tree friendly rope sleeves are included for quick and easy set up. Hang ropes pack inside the stuff sack for easy storage. BIGGER but LIGHTWEIGHT,Ufolded Product Size : Approx 118 in * 75in ; Packed Dimensions: 6 in (tall) x 5 in (diameter); Weight:1.8lbs; Maximum capacity of 660 lbs.